BARFIGHTS: SEAM Stream Viewing Party This Sunday! CouchWarriors is pleased to announce the first of a new series of events: BARFIGHTS! We are teaming up with Paloma Bar for viewing parties and special exhibition events. This first event will be a viewing party to watch the stream of the South East Asia Majors in Singapore. Come down to enjoy the event with the community over some drinks. Lets cheer on the Australian players heading to the event including the #BAM6 official envoy, Toxy! PLUS! EXHIBITIONS AND SPECIAL RIVALRY MATCHES! We have some fun show matches lined up for the downtime on the stream. More details soon! 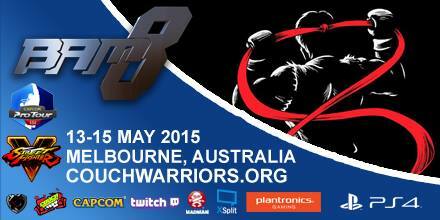 Want to relive the fun of Battle Arena Melbourne 6? Here is a collection of media, photo galleries, video specials and player reports. See the full results with replay archives and community awards here, and visit our partners, sponsors and guests in our Acknowledgements post here.